ILLUMINATI conspiracy theorists have been left in disbelief after Angela Merkel made her “secret hand sign” in the presence of royalty. 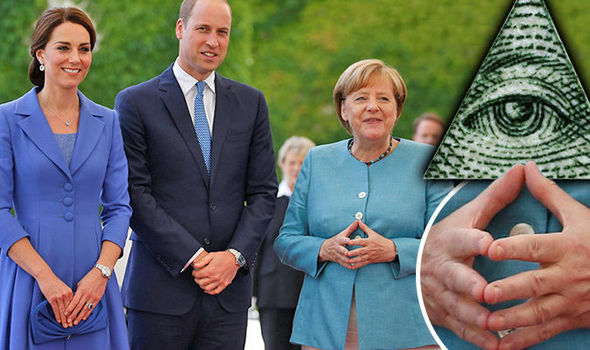 The German chancellor was snapped making the gesture as she met Catherine, Duchess of Cambridge and Prince William, Duke of Cambridge, at chancellery in Berlin, during their official visit to Germany and Poland. 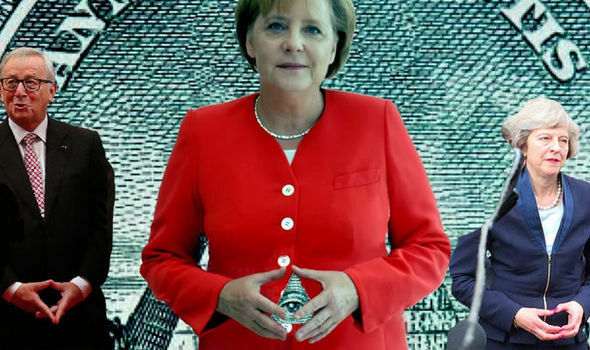 The “diamond” hand gesture, Mrs Merkel, is often seen making, is described by conspiracy theorists as a secret code to other members of the alleged Illuminati. It is alleged by believers of the Illuminati that it is a secret organisation made up of world government and business leaders and celebrities, which actually run all world governments from behind the scenes, and intend introducing a New World Order which will see just one government running the entire world. The conspiracy varies, but, at its most extreme, the Illuminati is allegedly a Satanic group which uses hand signals to identify members to each other. One version supported by ex-BBC Grandstand presenter turned conspiracy theorist, David Icke, even claims that members of the world’s royal families, such as Kate and Wills, are actually reptilian aliens disguised as humans. The sight of Mrs Merkel making the sign before the royal couple will convince believers of this far-fetched theory there is something in it. The German chancellor is known for making her infamous “diamond” hand sign, which has been branded of masonic-style and a symbol of the alleged Illuminati by conspiracy theorists. However, the royal couple did not return the gesture. Mrs Merkel’s use of the sign often attracts attention and she was last seen doing it at the G20 talks earlier this month. That was seen as of particular significance as conspiracy theorists believe the summit is an Illuminati-run show of strength and part of the plan to introduce a world army and global government known as the New World Order. The G20 Summit is identified on several conspiracy theory websites as a key Illuminati meeting, alongside the World Economic Forum and the secretive Bilderberg Meeting. Others photographed using the hand sign in the rhombus shape have included British Prime Minister Theresa May and European Commission President Jean Claude Juncker. The sign is often referred to as a Merkel Diamond, due to her frequent use of it. Mrs May was snapped imitating the ‘Merkel diamond’ while giving a speech outside the Palace of Westminster on July 11 last year. Merkel discretely displays the hand-sign at 0:26.